One thing I've been pondering about the "Under The Big Top" exhibition is how the inclusion of thematically-focused interactive components that require physical engagement (as well as a few exhibit installation "easter eggs") in a traditionally "hands-off" context, like an Art Museum, can, paradoxically, foster the types of behaviors (like careful observation and imaginative play) that we would like to see in every type of museum installation. 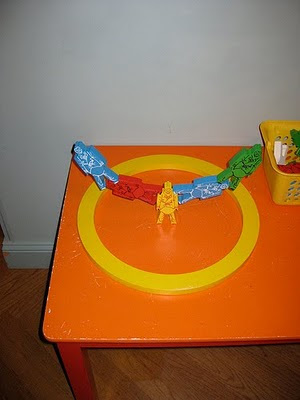 Here visitors get to create their own colorful patterns using these cleverly designed "acrobat blocks." A simple "circus ring" on the table adds to the opportunity for visitors to create wonderful sculptural forms in a "Big Top" context. 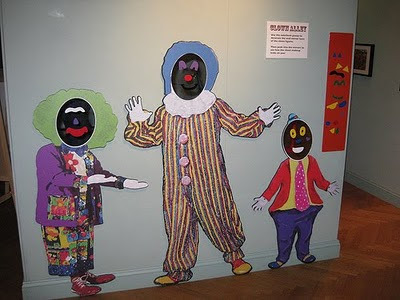 With this exhibit, visitors can experiment with form and color by putting "makeup" (actually cling vinyl nose, eye, and mouth shapes) on the mirrored clown faces. 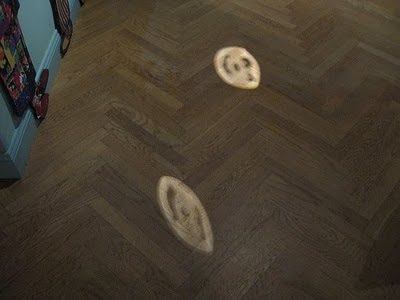 There's also a cool little "easter egg" lighting effect that shows a shadowy version of the colorform clown faces reflected onto the floor in front of the Colorform Clowns exhibit as well. 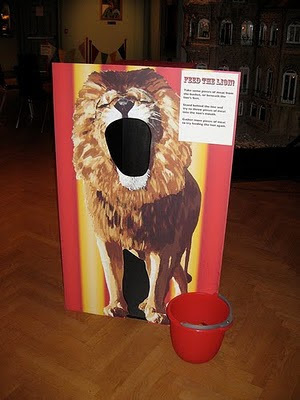 All the exhibits in "Under The Big Top" are simple, low-tech (no tech!) and open-ended opportunities for visitors to engage with both Circus and Art themes. The experience of putting together the "Under The Big Top" show has made me think even more carefully about the exhibit design possibilities of coupling "hands-off" museum objects with related "hands-on" museum experiences. What are your experiences with integrating hands-off with hands-on? Let us know in the "Comments" section below. When I worked for the Smithsonian Early Enrichment Center, I was constantly bringing interactive "objects" to the museums with me. I taught toddlers, and on our daily trips to the museums we would often visit museum objects that are not conventionally "toddler-friendly" such as paintings or historical artifacts. I used simple bring-alongs to help the children relate the abstract visuals to concrete objects that were familiar to them. For example, I brought plastic toy fruit to sort into buckets when looking at still life paintings of fruit. Once while doing a musical instrument theme and looking at a pianting with a piano, I brought a paper piano cut out with keys they could touch just like the lady in the painting. When the kids lifted the top flat of the paper piano they exposed the strings I had taped underneath and could feel and pluck them. It's those kinds of interactive components that you describe in your post that are necessary to make many museums accessible to the very littlest of audiences.